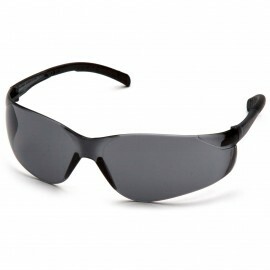 The T-71 safety glasses from Remington are a popular choice among hunters and shooting enthusiasts alike. With its ANSI Z87.1+ impact protection, these glasses offer excellent eye protection from fragments and other small flying objects. Remington T-71 Safety Glasses feature a sleek and stylish design that sits comfortably on your face and does not hinder your vision. The adjustable rubber nose piece and dual injection rubber temples provides cushioned support around your eyebrows, temples and nose. The wrap around lens design on the T-71 also protects your eyes from 99.9% of harmful UVA and UVB rays, for those working outdoors, while also offering some side impact protection. Find the right frame with the right colored lens that meets your specific need. These glasses are perfect for people working in the following industries; construction, engineering, landscaping, manufacturing and processing plants and more. Outdoor enthusiasts also use Remington glasses during hiking, mountain biking, rock climbing, skiing, snowboarding, skating, water rafting and more.